It’s officially fall and for a lot of the northern states in the U.S. it’s already feeling like winter. That means that furnaces are on and running hard to keep our homes warm as the temperatures are dropping and snow is falling. During these cold nights, your HVAC system becomes the most valuable piece of equipment in your home. Yet if it’s not running properly, you’ll experience less comfort and higher energy bills. One of the largest expenses for a homeowner is heating your home and producing hot water, so you want to keep your HVAC system running as efficiently as possible to ensure your energy bill remains as reasonable as possible. Is your furnace ready for the season’s challenges? Here are some tips to keep your HVAC running smooth and efficiently, keeping you and your family warm and your heating bills down. Changing your air filter is one of the easiest and most important things a homeowner can do to maintain their HVAC system, which is why understanding air filters and their function is so important. Furnaces have to work harder than they need to when air filters are dirty and clogged, unnecessarily driving up energy bills. When the air flow is blocked, it can cause system malfunctions and even equipment damage. Check your air filters at least once a month during the fall and winter and if they are dirty, change them with a fresh clean air filter. US Home Filters has a vast selection of furnace filters to fit your needs! Make sure you have some on hand to make monthly maintenance stress free so you won’t be without heat when you need it the most. The same day you change the air filters is also a good time to check your air vents. Just as we vacuum our home to get the dust and particles off the floor and carpet, the same needs to be done to the air vents. Most of the contaminants and particulates in the air that passes through your HVAC system are trapped in the air filter, but, over time, some are able to pass through and build up in the duct work. Vacuuming out your air vents will help prevent blockages and indoor air quality problems, allowing warm air to flow freely, easing temperature regulation throughout your home. If your ducts are clogged with an excessive amount of dust an debris, epa.gov recommends a thorough cleaning of the air vents. 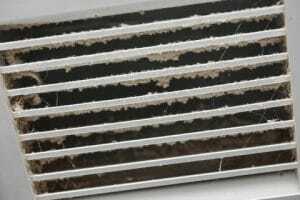 If this what you’re seeing in your HVAC system, it’s probably best to have your air vents cleaned professionally. If you see just a little bit of dust, a quick vacuum of the air vents can be done yourself to keep things running smoothly and efficiently in the fall and winter months. Insulation is the thermal barrier of your home, keeping heat out during the spring and summer, and in during the fall and winter, therefore playing a large role in the overall efficiency of your homes HVAC system. The more heat you are able to keep inside your home, the less your furnace has to work to keep the temperature consistent. First thing to check is your attic to make sure there is adequate insulation. If you aren’t sure if your insulation needs to be replaced to added to, don’t hesitate to call in a professional. There are many types of insulation and a professional will be able to help you select the right one and make sure your home’s insulation is adequate and efficient. The cost of adding or replacing insulation in your home is usually off set over time by the savings on your power or energy bill. It is highly recommended to have a programmable thermostat installed in your home. They take the guess work and human error out of the mix and maintain a consistent temperature throughout the day without question. They enable you to set a time for the temperature to change at the same time everyday – before you leave for work or go to bed – helping keep your thermostat set at the most efficient and energy efficient setting throughout the fall and winter months. If you already have a programmable thermostat installed, make sure it has a fresh set of batteries. To see the most energy savings, a cooler temperature is recommended when you are sleeping or not at home. According to energy.gov, you can save as much as 10% a year on heating and cooling by simply turning your thermostat back 7°-10°F for 8 hours a day from its normal setting. Having our HVAC system inspected annually ensures it is running properly. Fall is the best time to have your system inspected to make sure it’s prepared and running efficiently for the demands of winter. Looking for a heating and cooling contractor to inspect your HVAC system? The Department of Energy website offers instructions to help you find the right contractor for your needs. No matter which HVAC system you have, every unit needs a quality filter that fits properly in order to keep your indoor air quality clean and your unit running at its maximum efficiency in the fall and winter. US Home Filter can supply you with the best and most efficient HVAC filter available! Changing the filter in your furnace is as important as changing the oil in your car and US Home Filter makes filters that fit all AC/HVAC units. From standard to custom air filters, to whole-house filters, grille filters and humidifier filters, we have all of your filter needs covered!